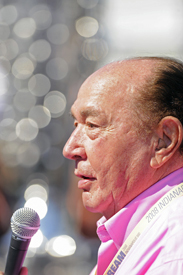 Former STP CEO and leading Indianapolis 500 identity Andy Granatelli has died in California at the age of 90. Granatelli made his mark on the Brickyard during the 1960s promoting STP oil products both in broadcast media and as a car sponsor, and is best known for the iconic photograph of him planting a kiss on Mario Andretti's cheek in Victory Lane at Indy in 1969. His earliest exploits at Indianapolis were as an entrant with his two brothers under the Grancor Racing Team banner in 1946. He also dabbled with the idea of driving, but quit after a heavy crash in qualifying in 1948. He rose to prominence just over a decade later when he bought the rights to the fearsome Novi V8 engine that ran in various incarnations between the early 1940s and late 1950s. 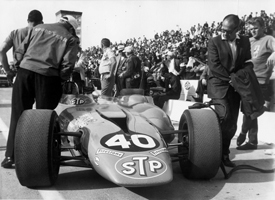 Attempts to take the Novi into Victory Circle proved fruitless, but he came close with Parnelli Jones in a turbine-powered Studebaker in 1967 (pictured below), and again with Joe Leonard and Art Pollard in similarly-powered Lotus 56s a year later. On all occasions the cars broke while leading within sight of the finish, but he finally achieved success with Andretti in a conventionally-engined car a year later. A second victory with Gordon Johncock followed in 1973. "Andy Granatelli understood better than anyone the spirit and challenge of the Indianapolis 500, and had a remarkable ability to combine innovative technologies with talented race car drivers to make his cars a threat to win at Indianapolis every year," IMS president Doug Boles said in a statement. "Andy leaves a legacy of historic moments that will live forever in Indianapolis 500 lore." Granatelli's influence also extended to NASCAR, where he was responsible for the STP sponsorship of Richard Petty that lasted more than three decades. Prior to rising to prominence with STP, Granatelli ran an auto shop with his siblings, and became a race promoter during the Second World War.